theAd>>This is at least 30 years old, shows some wear as it has been played with over the years by my kids and then grandkids. As the toy is pulled the top spins and hits the bell with a metal piece that makes the bell ring after going through one whole spin. 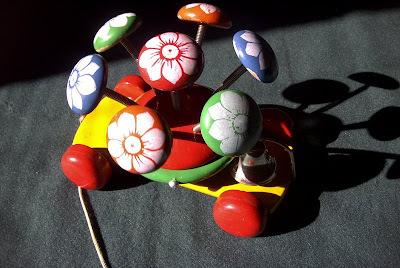 The wooden "flowers" are suspended by coiled wires that make them wiggle as the toy is pulled. News flash. You buy your kids toys to keep them occupied so you can have a moment of peace. I do not see how this jiggling, dinging and beltching lead paint and mushroom cocktail really fits the bill. Sooooo.. let your kid cry. It's less annoying and you save ten bucks.